There are a variety of ways to learn to fly fish for salmon, including individual lessons, or a sequence of lessons if you live locally, or occasional formal courses and custom short breaks for those who wish to take time out to learn. Our salmon casting instruction usually takes place on the river; generally on, but not limited to, the River Alness or River Conon. Sometimes we start things off with a short session on grass or on the lochan, particularly for larger groups. 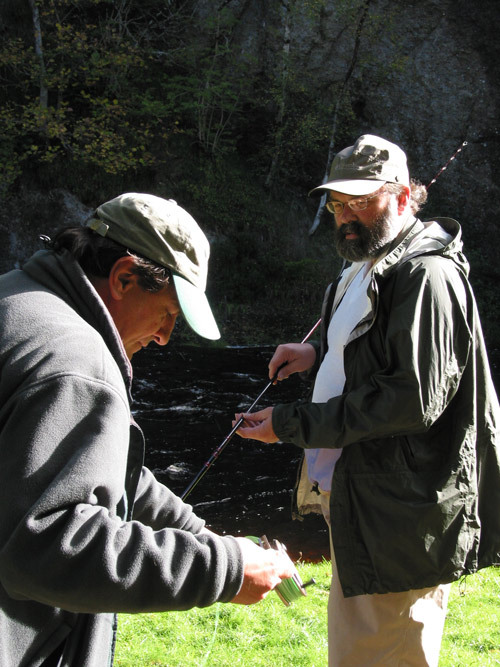 It is generally much easier (and therefore faster) to learn a basic cast with a double-handed salmon rod than with a single handed trout rod, though of course it still takes a lot of time and practice to master these casts. 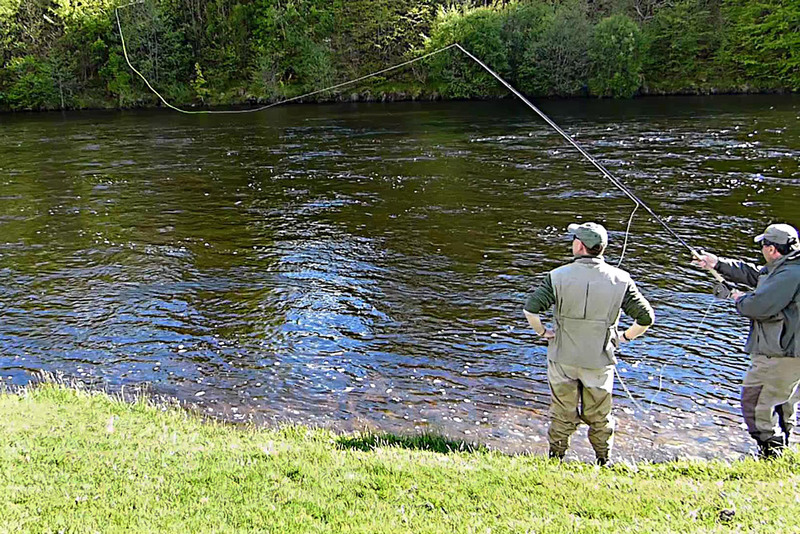 For beginners we start with the roll cast aiming to progress quickly to the jump roll and single Spey cast, but we also teach overhead casting, the double Spey and snake roll casts. For novices seeking their first taste of salmon fishing we generally recommend a full day as an introduction, which provides an enjoyable day out with a chance to catch your first salmon. Occasionally, we offer 'Learn to Salmon Fish' courses of 4 days in length. The majority of time spent is in learning salmon casting and fishing on the river, but there are also some 'classroom' sessions on aspects of salmon fishing including the salmon life cycle, salmon behaviour and tactics etc. As with trout fishing, instruction need not be limited to basic casting, and for 'intermediate' salmon fishers we can also teach additional methods of casting, different tactics and 'rivercraft'. Customised short breaks are undoubtedly the most flexible in terms of timing, but also offer the most efficient way of getting a basic grounding in many aspects of salmon fishing in the shortest overall time. As a dedicated holiday for salmon instruction, ideally we would recommend at least 2 to 3 days of fishing, but these days can sometimes be spread out during a week to allow you to enjoy other things that the Highlands have to offer. 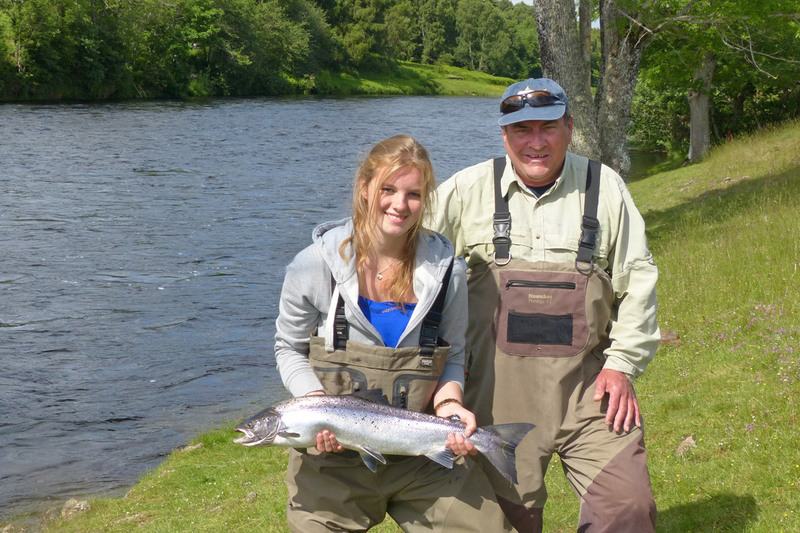 Follow this link for more information on our 'Learn to Salmon Fish' Short Breaks. For all salmon fishing tuition, we can provide all the tackle required. For larger groups, where necessary and by prior arrangement, ghillies or additional qualified instructors can be brought in to assist. We have now posted a number of short videos on YouTube that include footage captured during some of our instruction and guiding salmon fishing days. All of these videos are on our SalmonQuestTV channel. They are best viewed in a large window at 720p resolution or better, so make sure you update the YouTube settings before viewing.